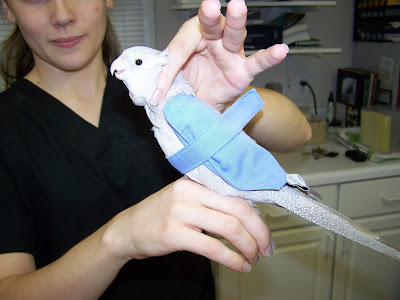 We recommend that owners do not restrain their own birds. Pet birds can become distrustful of owners when handled this way; some birds forgive, others do not. Good parrot-owner relationships are totally dependent on trust. Pet Bird owners can purchase them for their own birds and bring them along for their visits to the veterinarian and groomer. For complete descriptions and video demonstrations visit AviStraint.com.